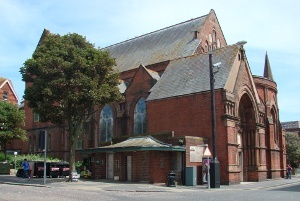 A proprietary chapel was built in 1826 for the newly developed area east of the Old Steine. Like St Margaret, Cannon Place and the nearby St James (the parish was joined with the latter in 1949), the circumstances of its design are obscure and, like St Margaret again, it is linked with I Clarke of London (Colvin 3rd ed p251), though as in that case he was in fact the clerk of works (1 p171). Thus the more prevalent attribution to A H Wilds (Sawyer I p379) (at this date presumably with C A Busby) may be accepted. It then had an oblong plan with a big Grecian portico and pediment at the ‘west’ (actually south) end. Inside, were box pews and galleries (2 p8). 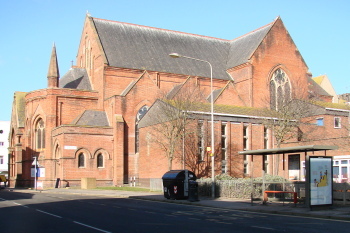 Before St Mary’s became a parish in 1879 (Sawyer I p424), it was decided to extend the chapel with an apsidal chancel by Sir W Emerson (B 34 p601), which was started in 1876. Before work had gone far, much of the chapel collapsed and proved so badly built that it was decided to rebuild it completely in the gothic style (ibid p637), keeping Emerson as architect. Over £20,000 were raised and construction took only 15 months (Sawyer I p418). The actual cost of the building is said to have been £17,331 (KD 1899). 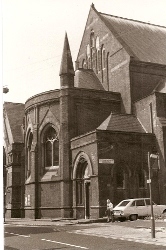 Though a major church, the exterior is plain as only the ‘west’ end was intended to be seen. The plain, brick sides have large windows, though the later public convenience in place of houses along Rock Gardens cannot have been foreseen. A bowed west baptistery projects by a porch, which was intended as the base of a tall tower with paired bell-openings, a round spire and open pinnacles (BN 38 p10). The detail would presumably have been terra cotta like the porch and baptistery windows. 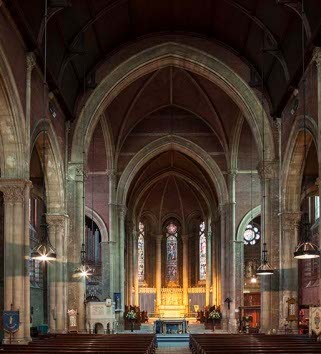 The interior is entered at street level; the main floor level is mostly below this, permitting greater height inside without an overbearing exterior and derived perhaps from St Martin, built a couple of years earlier. The detail, French in derivation, shows the influence of W Burges (Emerson was his pupil). It is faced in brick with stone detail including fine foliage capitals. Across the narrow aisles are transverse arches and the nave roof has small hammerbeams (almost the only English feature), but the rest is vaulted in brick. The barrel-vaults of the transepts are in fact made of concrete (BN 35 p437) whilst those of the crossing and apse are ribbed. The smaller east crossing arch leads to an apsidal chancel with an ambulatory behind narrow arches with stilted heads. Emerson designed the mosaic floor, which was made by Burke and Co of London (ibid). Font: Alabaster round bowl with carved figures, carved by T Nicholls, 1880 (BN 38 p10). 1. 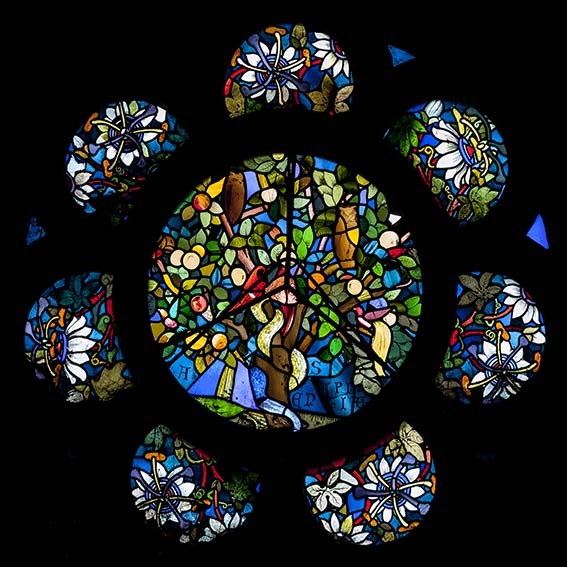 (Rose window in chancel aisle) G A Luxford, 1878 (BN 35 p437). 2. (Baptistery west window) G A Luxford, 1878 (www.stainedglassrecords.org retrieved on 4/2/2013), though the church website gives the design to W G Saunders. 3. (North aisle, second window), Burlison and Grylls, c1880 (ibid). 4. (Apse) three main lights by A O Hemming, 1886 (ibid). 5. (South transept and aisle) A O Hemming, 1884-85 (BN 46 p466). Dark colouring. Only one lancet of the transepts has any glass today, but there may have been more originally. 6. 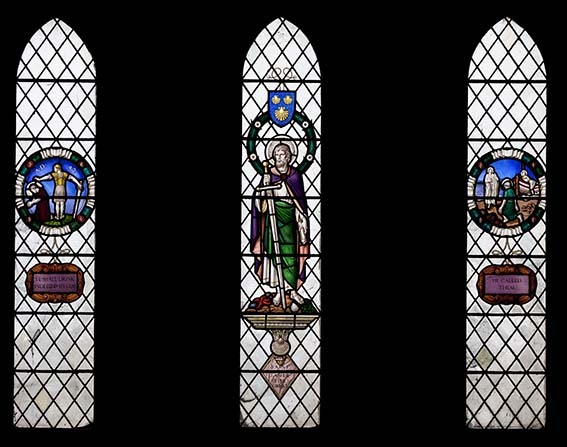 (Baptistery) Four windows by A O Hemming, 1884-85 (BN 48 p670). 7. (North aisle, third window) J Powell and Sons, designed by F Mann (Hadley list) 1897 (Order book). 8. (North aisle, first window) C E Kempe, 1906. 9. (North transept) A composite, with the centre light and the glass in the tracery by Mayer and Co, 1882. The two side-lights were blown out in the great storm of 1987 and were replaced in 1989 by abstract glass by A Goodman, which echoes the lines of the centre light, though not its colouring, for the tones of the newer glass are predominantly paler. The bottom lights are by K Barton, 1942 with much clear glass (www.stainedglassrecords.org retrieved on 4/2/2013). 10. (South east chancel) J Powell and Sons, 1915 (ibid). Designed by J H Hogan and —- Read (Hadley list). 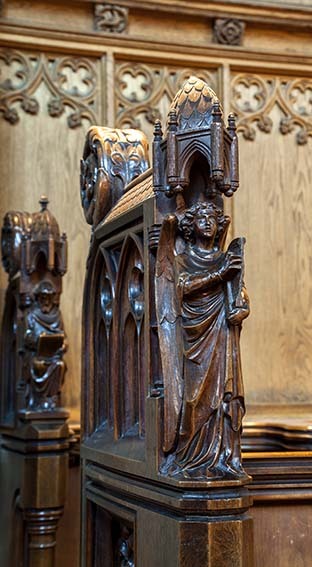 Pulpit: Caen stone (CDK 1878 pt 2 p70). It has carved sides on an arcaded base, 1878. Reading desk: (Formerly) With the figure of an angel, 1878 (BA 10 p164). 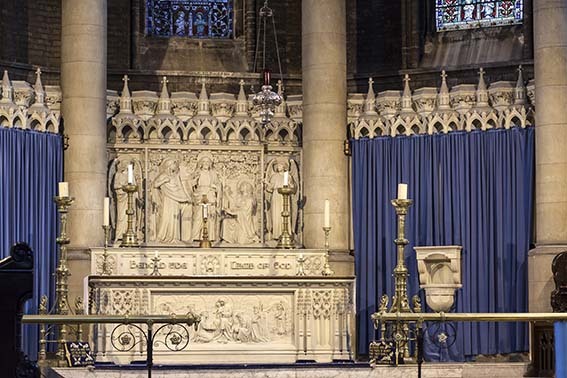 Reredos: The central part of the marble division between sanctuary and ambulatory, with canopied figures. These date from 1893 and are possibly by T Nicholls. Screen: (Across South transept) Conventionally gothic in style, Presented and partly carved by M Drummond-Roberts in memory of her husband (d1926), 1928 (CDG 1928 p213). Stations of the Cross: (From St Thomas, D’Avigdor Road) By H R Mileham, who delivered them over a period of time and in a variety of styles (CCL 1920 and P Mileham p14).